After the grilling season is over, it is a good idea to ensure that your barbeque grill is placed into a storage space to avoid the winter weather. Preparing your barbeque grill and placing it into a storage space will ensure that it lasts a lifetime. Here in Des Moines, our winters can be especially hard on your grill, so following these steps will ensure that you get a full lifetime of use from your equipment. In order to protect your equipment from critters or corrosion, it is important that you thoroughly clean your grill before placing it into your storage space. With a gas or electric barbeque grill, you will want to brush clean the grates, flavorizer bars, and burners using a grill brush. Scrape all the interior surfaces and push the loose debris into the grease tray and into a drip pan. Once you have emptied out your drip pan, your grill will be ready to store. 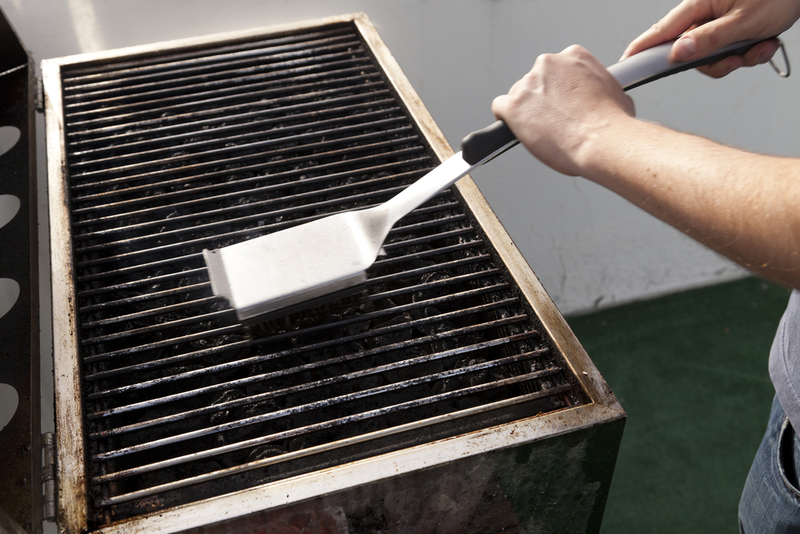 For charcoal models, brush the cooking and charcoal grates clean with a grill brush. You can also use a putty knife to scrape grit and debris from the interior surfaces. Brush and scrape all the material into the ash catcher of your grill and then empty your ash catcher. After you have cleaned your barbeque equipment, coat the metal parts of your grill with cooking oil to protect from moisture and potential rust damage. Many people also recommend wrapping the burner unit in plastic to ensure that insects do not try to nest inside of your gas tubes during the winter. If you are storing your gas grill in a storage space, it is important that you first remove the propane tank from the grill. Anytime propane tanks are stored indoors, there is a risk. A small gas leak can build up in enclosed areas and present a major explosion risk. Instead, disconnect the tank and store it in an upright position outdoors in a safe location, away from your dryer or furnace vents. Tape a plastic bag over the grill’s gas line opening to prevent insect nesting. At Affordable Family Storage, we offer climate-controlled storage spaces that can prevent moisture buildup from humidity changes. Our storage units are the best option for keeping your barbeque grill protected and secure during the winter months. Just follow the above tips before placing your grill into the storage unit, and, once spring rolls around, your grill will be ready and waiting for the new grilling season. Contact Affordable Family Storage to find out more information.